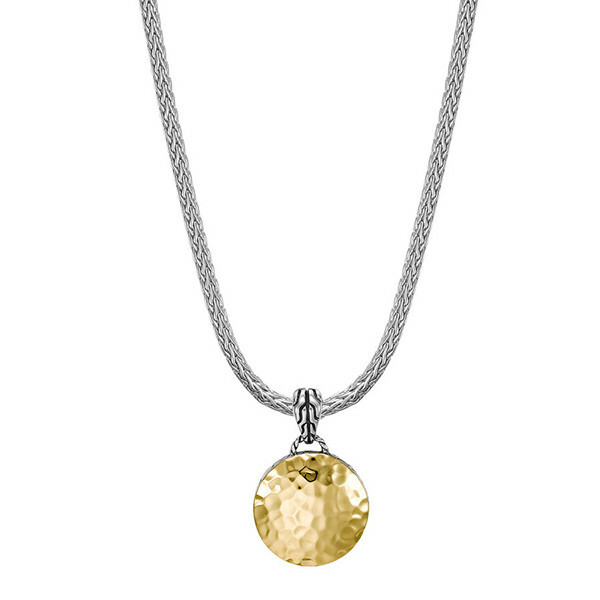 Add a touch of class to your outfit with this stylish round pendant from the Palu collection by John Hardy. A single round disc is crafted from shiny sterling silver, and an 18kt gold overlay with a rippled effect is placed on the surface for a beautiful two-toned look. The classic chain motif is apparent on the edge of the disc and the bail. Floating freely on an 16"-18" adjustable classic chain, this pendant is the perfect John Hardy accent!